In our Petition for Investigation of Time Warner Cable (TWC) and Comcast, we point out that TWC's High-Speed Internet service has a 97 percent profit margin and a number of people asked how that statistic was derived. Simple. Time Warner Cable provides the information, (with some caveats). Moreover, we need to put this financial information in context to what customers are paying, and more specifically with the Time Warner Cable Triple Play bill that's been featured in previous articles. 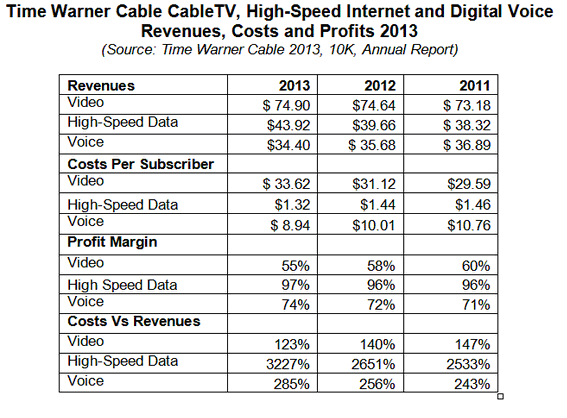 Time Warner Cable supplies the 'average monthly revenue per unit' for "video" (cable TV), "high-speed data" (High-Speed Internet) and "voice" service; I.e., what customers are paying for these services to TWC. While I have no idea what 'customer relationships' are, we see that High-Speed Data's (Internet) average revenue was $43.92 for 2013, up from $39.66 in 2012. Note that the annual report explained that this increase was in part due to an "increase in equipment rental charges." In the next exhibit we see the 'cost of revenue', which is what it cost TWC to provide the service. If you look at the bottom of the excerpt, you will see that the "average monthly Voice (phone service) costs per subscriber" to offer the service was $8.94. Exhibit 1 shows that the average cost to customers, (the revenues for Voice service), that customers are charged per month by TWC, was $34.40. This yielded a profit margin of 74 percent. The 'Cost of Revenue' for Each Service, and other Expenses, 2013. Equals-- The company makes $24.46 in profit per customer per month -- 74 percent. We give the cross-referenced information in Exhibit 3, which was part of our Petition. But wait a minute --What about High-Speed Internet? Well, if you stare at the information supplied by Time Warner Cable in Exhibit 2, you will see that for some reason, while the company supplied the "Voice" service and the "Video" (cable TV) service, they didn't bother with the High-Speed Internet. I would speculate that it is because it is so obscenely profitable that the company might be concerned that some regulator or politician would actually notice and question the profits about broadband. But, using identical calculations we find that the High-Speed Internet, while it costs customers, on average, $43.92, the total costs to TWC to offer the service was only $175 million -- resulting in a 97 percent profit margin. Note: There is other information that supplies the number of total subscribers. Here's the math based on these exhibits. First, you may have noticed that there are other expenses detailed in these financials. But, where are any breakouts of the 'common costs' vs the costs to offer each service? A company doesn't supply the data for separate services unless there is a reason. One reason could be to manipulate the accounting of the Triple Play in general. Here's just a few of the issues. Where's all those dirty little additional charges? On the Time Warner Cable bill, there are franchise fees, 'made-up' fees, pass-through taxes, not to mention other revenues from the Internet modem rental, for example. Is the modem rental included in the 'costs to offer' High-Speed Internet or show up as part of the revenues as the rental fee cost the customer in NYC $5.99 a month? Does the cable TV costs to the customer include the set-top box at $11.25 a month? Are the made-up fees, pass-through taxes, etc., allocated to the Internet service or any of the itemized services? On the Triple Play bill these additional charges added about 20 percent to the total of $190.77 -- over $35.00, though some of these are not revenues. It would require an audit to see which of the taxes, fees and surcharges are pass-through taxes, i.e., the customer is charged taxes that are being applied to the company but they get to pass-it-through to the customer, or where the fees, like the 'broadcast fee', are being accounted for in these financials. These types of made up fees are buckets of money that go back to Time Warner; they are NOT mandated as an expense by any regulator or taxing authority -- it's just pure profit; which are normal costs that should have never been a separate charge. Where are the Social Contract Revenues? Then we have the "Social Contract" monthly addition that was added in 1995-2001, which was a charge of up to $5.00 a month that was allowed by the FCC to upgrade the cable networks and high-speed services, as well as to wire the schools. As we uncovered, while the Social Contract 'expired' in 2001, the cable bills show no signs that this additional charge was removed. Was this revenue added as a cost to customers for the Internet service or did it just turn directly into profits? Who knows? There have been no audits. But with a 97 percent profit margin for High-Speed Internet, you would think some regulator in some state would have investigated. We found no such investigations. "Ala Carte" Pricing Is Killed by the Manipulation of the Revenues and Profits. Ala Carte pricing is -- pay for the cable TV channels you want to watch vs getting hundreds of channels that you don't care about. We keep hearing that ala carte pricing can't be offered as the costs of the programming are just too high. But most customers would probably want ala carte pricing because the average customer watches only 17 stations. That's it. Nielsen is the bible on TV viewing and according to them, from 2008-2013, while there have been a growing number of channels, people only watch about 17 stations per household. That's it. "The average U.S. TV home now receives 189 TV channels--a record high and significant jump since 2008, when the average home received 129 channels. Despite this increase, however, consumers have consistently tuned in to an average of just 17 channels." Is the Triple Play Rigged? What would happen if all of the revenues of the Triple Play services were added together -- where the cable TV, High-Speed Internet and Voice service revenues were used to calculate the 'ala carte' pricing model? Simply put, take all the revenues a customer pays for services over the cable wire, as well as calculate all the expenses for these services, and then calculate ala carte pricing for Triple Play customers. Instead, the companies use this manipulated mathematics on purpose to make it appear that the cable TV ala carte pricing couldn't possibly work. In the current FCC proceeding about Open Internet, commonly known as "Net Neutrality", one of the issues surrounds what the competitors and content providers, such as Netflix, are paying to connect to the cable networks. On the other side, the 'slow-lane-fast-lane' discussion is all about charging end-user customers more or getting your service slowed down in some way. To put it bluntly, with a 97 percent profit margin for High-Speed Internet, TWC has given its own services 'priority' favoritism, a sweet-heart deal -- call it what you want, but any other company would never, ever pay $1.32 a month to use the TWC networks to offer competitive High-Speed Internet, but this is what it costs Time Warner Cable's ISP, the part of the company offering the Internet and broadband service, to offer end users High-Speed Internet service. Competitors would most likely have to pay about 50 percent or more of the 'retail' average price of $43.92 to offer their service as a competitor. If customers have been 'defacto' investors, paying an extra $5.00 a month since 2001 under the "Social Contract" to fund upgrades of the cable networks for High-Speed Internet, why shouldn't these networks be open so we can choose who offers us Internet or cable service over these wires?" With High-Speed Internet showing a 97 percent profit margin in 2013, there's something very, very, very wrong with all of this. In our Petition for Investigation, which was filed with the FCC as well as the New York State Public Service Commission, we not only ask these regulators to halt the proposed merger of Comcast and Time Warner Cable, but to investigate the obscene profits documented in the companies' own financial reports. My Time Warner Cable basic Triple Play bill went up 112 percent in just two years, from the advertised price of $89.99 to $190.77. I want an investigation as I'm not the only one this happened to. What will these agencies do? What do you want to have happen next?